In a Daily Candy e-mail, that I recently received, they talked about a new, young jewelry designer named Pamela Johnston. 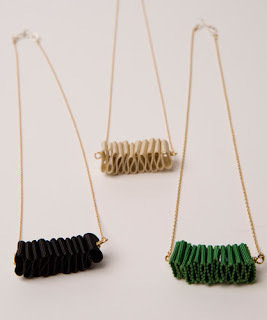 She graduated Parsons and now has a line of Edwardian inspired jewelry called Plume. Here are a couple of pieces, but you should really take a look online. To check her website and full collections out, click here . My favorites are the cameo and the lioness necklace for the Spring '08 collection. If you've gone to the Plume website, you'll notice that the models are wearing really great clothes. They were designed by another Parsons graduate named Miranda Bennett. The line is simple and chic, and consists of easy and beautiful clothes that could serve for day or night. Click here to check out the rest of her collections. Her stuff is beautiful. I check it out, and I personally love the Knot rings, they are simple and beautiful. i love the dresses. i might check out her stuff! i hope you start blogging more, because i love your website! !